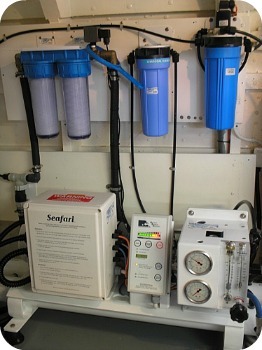 A ro watermaker is a great piece of equipment onboard. Through the proces of reverse osmosis (ro), seawater is turned into drinkable fresh water. Now that's incredible! It gives us autonomy and that's a big deal when you're a cruiser. Now, marine watermakers are not hard to maintain, but there is a minimal amount of maintenance to keep them in a healthy state. You cannot forget about them! First of all, you have to keep the membranes wet. Leaving them to dry out is deadly for them. Simple, you just have to run them once every week as a minimum. A watermaker doesn't like to sit still! 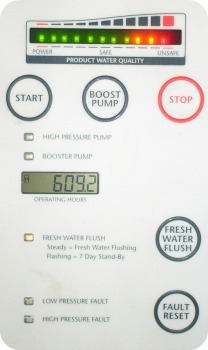 Some ro watermaker sets have an automatic feature called a 'fresh water flush'- cycle. 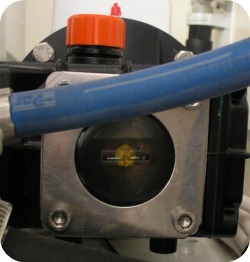 This means that it automatically flushes the desalinator with fresh water. Now, the catch with this is, that it only works when the electric supply to the watermaker is continuous. If, for some reason, the power goes out and then back on, the timer starts from zero, so technically the ro watermaker may not have been flushed for weeks, if you leave it unattended like that. 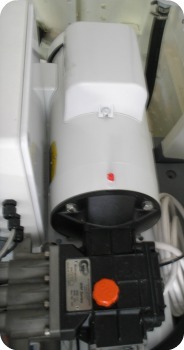 Another remark concerning the regular flushing or turning of your watermaker is that when you run it and you take seawater from outside, it's better when you're at sea and not in the yacht marina. Seawater is drawn in from the outside and so we have to make sure it's just seawater and no other things that aren't supposed to go through the ro watermaker. So, first of all, check your seawater filter regularly. It's just behind the through-hull fitting at the beginning of the suction line. 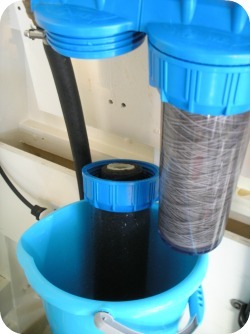 If there's too much debris or other materials stuffing the filter, it gets hard for the watermaker to draw in enough seawater, which might cause the watermaker to stop. Next, further on the suction line, you will see a few other filters that are making sure that the seawater is filtered even further. 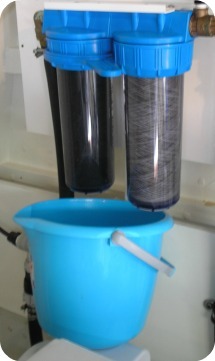 There are several set-ups, so you might have another pre-filtration system then the one I show. The bottom line is, that you need to replace those filters regularly. It's better for your ro watermaker and it will last longer. Opening up a filter might cause some water to fall on the wrong spot. I use a small bucket to put under the filter I'm opening up. Second, open the filter housing by hand or with a water filter housing spanner wrench. Turn it counter clockwise, gently until the bottom part of the housing falls in your hand. put the new filter in. 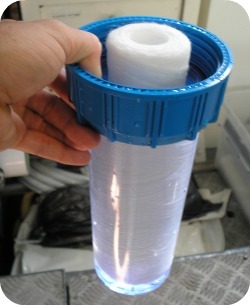 Fill the plastic water filter housing with water, from your water tank, almost to its top. Check if the rubber o-ring is still in place and in good shape. Then you screw the whole lot clockwise to its upper part until its tight by hand. Don't force it! Do this with all the filters that you have. Not all filters need to be changed at the same time, though. For example, I have a 25 and 5 micron filter on my system. These ones, I only change when I see that the vacuum/low pressure gauge falls under 18 psi or 1,2 kg/cm². Or when they get really dirty. 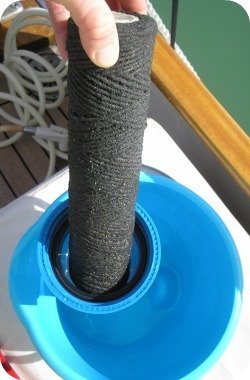 The other 2 filters I have, a VOC carbon block and a charcoal element, I change every month during cruising season. Also remember to check for leaks, after you have replaced your filters. 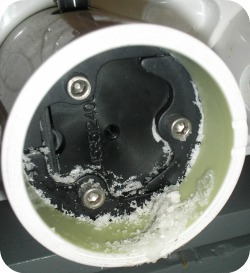 By cleaning your marine desalinator with a moist rag, you are able to spot leaks. Either water leaks or oil from the high pressure pump. 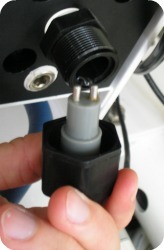 Leaks can occur because of the vibration of the set. Cleaning has thus an important function. It's also a good idea to check the salinity probe or salinity meter. This measures the degree of saltiness in the product water and makes sure that only potable water goes to your fresh water tank. Check if it is clean and without any debris. Use a soft bristle brush if there is any debris built-up on the probes. Clean it's thread and replace the old Teflon tape with new one. Screw it back on, now clockwise. Your high pressure pump has a little oil reservoir in which the crankshaft and plunger rods are. After the first 50 hours you need to do an oil change, thereafter depending on what your watermaker manual says. I do it after every cruising season. Through the glass you see the oil level. Above the middle mark is good. Changing the crankshaft oil is very straight-forward. Get the recommended oil from your watermaker manufacturer. Open the oil cap, so it can vent. On the bottomside of the crankcase, you'll find an oil drain plug. Turn it counter clockwise, until you have it in your hand and the oil drains in the little flat container you have put under it. When all is gone, close the drain plug and fill the crankcase with new oil until you have reached the recommended level. Then close the oil cap. When the watermaker is turning, check for leaks. This is all there is to it! All very sensible. If you care for your ro watermaker, it will take care of your water needs for a long time! To winterize your unit, click here.